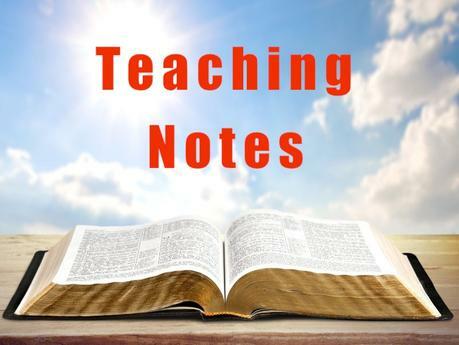 These teaching notes are from a series of studies about faith. For the last three broadcasts we’ve been sharing with you about the power of faith. I feel a definite burden from the Lord to share with you today, not another message on the power of faith, but a message on the problem of faith. Well, the problem of faith is that most of us have very little of it. That’s right! Most of us as God’s people have little faith. We’ve heard that the victory that overcomes the world is our faith. We’ve been taught that faith is our great defensive weapon against all the fiery darts of the wicked. We’ve learned that faith is essential in prayer. We’ve heard all these messages time and time again. My question is this: since we all know this to be true, why don’t we “live by faith”? We’re so concerned that we be doctrinally correct about the issue of faith, and so am I, but why do we stop there? Why not go on and live by faith? Isn’t it time that we walk what we talk? I believe there are two basic reasons why most Christians do not live by faith. We are rejecting what His Word says about faith living. On today’s broadcast, I’m going to talk to those of you who just don’t know what God expects of you in this area of faith. Now that we’ve been saved by grace through faith and stand in positional sanctification and are justified before God, how should we live? This is a good question. Is there any difference in the way we live after we’re saved? Or are we just saved from hell and now we can go along our merry way doing whatever we please? Listen, my friend. The great promise of Christianity is that we can and will be changed! Before I was saved, I was a cursing atheist. I hated everything decent. I breathed out hatred for Christians and the Church. I lived a wicked and sin-filled life. I was destroying my body and mind through wickedness. If, when I got saved, all that happened to me was that I got a free ticket to Heaven but no change in my life, Christianity wouldn’t be worth much during our time on earth. When I got saved my life immediately began to change. I became a new creation and God began to change my life. Praise the Lord! That’s something to shout about. God changes lives! He takes atheists and makes them Bible teachers. He takes drunks and makes them into evangelists. He takes harlots and makes them into heroines of the faith. He takes drug pushers and makes them into servants of God and others. God is in the business of changing people’s lives. Now that we’re saved, the Scripture teaches us that we are to live by faith. What does Paul mean by that? Turn in your Bible to Hebrews 10:38. The Hebrew Christians were being called by some to return to Judaism and obedience to the Mosaic Law. The letter to the Hebrews was written to give direction to Jewish believers. The writer to Hebrews demonstrated powerfully that the New Covenant is better than the Old Covenant, that Christ is a better sacrifice than the Levitical sacrifices, and that Christ is a higher Priest and Prophet than Aaron and Moses. In Hebrews chapter 10, the writer appeals to a life of faith and warns against a lapse into Judaism. In verses 32-34, he calls upon the Hebrew believers to remember the days past when they proved their faith by enduring “a great flight of afflictions.” They had also proven their faith by taking the abuses of non-believing Jews and their compassion for the writer (probably Paul) in jail. They also took joy in having their possessions and goods spoiled — looking with the eye of faith at a better and abiding possession in Heaven. In verses 35-39 the writer calls upon them to continue in patient faith. Faith is to be the theme of the believer’s life, not legalistic forms and works. In verse 38, God was saying that the justified shall live by faith and that if any of the Hebrew Christians drew back into Judaism for fear of persecution, he would be very displeased with their decision. For a moment, let me share with you what other versions and translations of the Scripture have to say about living by faith. This is an Old Testament quote from Habakkuk 2:4 repeated by the Apostle Paul in Romans 1:17 and Galatians 3:11. Over and over again God has told us that we are to live by faith. This is talking about “serving faith.” Saving faith is to present us justified before God. Serving faith is our walk and talk in this life. Christianity is not some game we play on Sunday mornings. Christianity is a whole lifestyle that is played out every hour of every day of every year – forever! Christianity is not “getting from” God – it is “giving to” God. The question is often asked, “Why do most Christians give out while trying to walk by faith?” One answer is they “give out” because they’ve never “given up.” We want our cake and eat it, too. We want to be saved and know the joy of everlasting life, but we don’t want to live for God now. If we’re saved by faith and glorified by faith, then how do we think God wants us to live in-between? We know that God saves us by grace through faith. We know that we will one day we will be glorified by faith. However, between salvation and glorification, we want to live our own selfish way – life by sight. God is not pleased with that kind of lifestyle. That’s what He saved us from living. He saved us from our selfish lifestyle to His selfless style of living – living by faith. We will never please God without faith and until we have pleased Him we have not succeeded in our Christian life. If we are to be successful in the Christian life, we must live by faith. Just what does it mean to live by faith? It means we rely on Christ for everything – everything. It means we are not affected by what others say or do. We are affected by what Jesus tells us to say or do. God is our source of supply and we look to Him and to Him only for our lives. Most of us look to an employer for much of our supply, but God says to have faith in Him. If we lose a job, we get nervous and exasperated. “Oh, what am I going to do? Where will our food come from? How will we pay our bills?” If we are living by faith, losing a job should not bother us because we will have our eyes on Jesus for our daily supply. If God uses another job to meet our needs, that’s great. If He uses something or someone else to meet our needs, that’s great as well. We have one obligation to God and that’s to be faithful in doing whatever He’s called us to do. By this I do not mean we can just quit our job and sit around waiting for God to supply our needs. If God called us to work at a job, we should do what He says and be faithful. However, if God takes that job away, don’t worry. Be faithful. Seek His will about the matter. Is God telling us to move? go back to school to prepare for a different vocation/ministry? Listen to God and He will tell us what He wants us to do. We all need to listen to what God says to His children. God knows exactly what we have need of and has promised to supply all of our needs according to “His riches.” Most of us live according to our own riches, If we have money in the bank, we’re pretty happy and content. However, if we’re out of money we get upset and frustrated. Look to God! He is our source of supply.